Since 1999, John Nguyen has built a solid reputation helping local families and small businesses plan for a better tomorrow. Armed with the formidable resources of Commonwealth Financial Network®and an impressive background in business and financial planning, he's guided his clients through the most challenging economic environment in generations. The son of Vietnamese refugees, he was raised with a keen appreciation of the opportunities the American system of free enterprise affords. A new father himself, he's focused on helping local families achieve their dreams. And as a grateful and respected member of our community, he's determined to help make it an even better place to live and work. A devoted family man, John and his wife, Kaci, are the proud parents of two girls and a baby boy, Lilly Anh, born May 2010, and Hadley Mai, born July 2011, and Reagan Thoi born August 2014. John Nguyen didn't learn to appreciate our free enterprise system from the pages of a book. It was ingrained in him by parents who'd seen firsthand that with hard work and integrity, every American can achieve a better future. John's mother, Ngoc Anh Tran, and father, Nguyen Van Thoi (a South Vietnamese soldier and translator for the American military), awaited John's birth while Thoi was imprisoned at a brutal “Re-Education” camp in Communist Vietnam in the difficult days following the fall of Saigon. Determined to give their children a better future, the Nguyen family ultimately managed to escape Communist Vietnam, resettling in Northern Virginia. His parents went on to open several well-known local restaurants including the nationally acclaimed “Nam-Viet” in Arlington and Washington, DC. The Nguyen family imbued their children with their own love of free enterprise, hard work, thrift, and integrity - principles that guide Clarendon Wealth Management today. Upon graduating from Mary Washington College with a major in business administration, John launched his financial career with American Express Financial Advisors. A CERTIFIED FINANCIAL PLANNER ™ professional, John continued his studies at the Wharton School in Philadelphia in conjunction with the Investment Management Consultants AssociationSM, becoming a Certified Investment Management AnalystSM with advanced proficiency in portfolio management and financial planning. John holds his designation as an Accredited Investment Fiduciary®, named as one of the “Ten Most Wanted Designations in the Financial Planning Industry” by Financial Planning Magazine. The AIF® designation recognizes a financial planner's ability to implement a prudent process in the investment process and a commitment to the AIF Code of Ethics in fulfilling their unique position of trust. He is an active member of both the Financial Planning Association and the Investment Management Consultants Association (IMCA). With Clarendon Wealth Management -CWM-John returns to his roots, with an office overlooking the site of his family's first restaurant in the Washington, D.C. area, the original Nam-Viet in Clarendon, just off the Clarendon Metro. 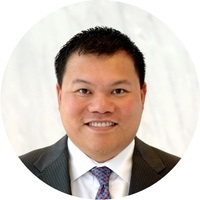 CWM is the new name for the firm John founded in 2007, Nguyen Financial Management, with offices in Falls Church. Like its predecessor, the Financial Professionals of Nguyen Wealth Management are partnered with Commonwealth Financial Network. John is especially proud of his service to the Virginia Hospital Center, where he is a member of the Board of Directors and Chair of the Finance Committee. An active participant in the Hospital Foundation's Galen Society, which helps the Hospital continue its delivery of quality healthcare to all Northern Virginians, regardless of their ability to pay. Recently, John was elected to the Society's Executive Leadership Committee, which privately raises the funds necessary to enable the hospital to continue its life-saving work. In his spare time, John enjoys bringing dinners to the parents of children with cancer being treated at the Children's National Medical Center. An avid sportsman and fly-fisherman, he supports both Project Healing Waters and the Federation of Fly Fishers. As a member of the Tidal Potomac Fly Rodders, he helps introduce local underprivileged youth to the sport and takes part in the group's annual “Jim Range National Casting Call,” which gives policy makers and elected officials a greater appreciation of the importance of collaborative fisheries conservation during a day of shad fishing on the Potomac River.